Digital temples are real spaces. Release the shame about your creative process, how it works, the time it takes, and your desire to be connected online. It’s ok. We are all seeking connection. We can create it both in the quantum matrix (online) and in physical temples (in matter). What matters is HOW we approach these connections, our intentions. Even the energy we bring to the computer. I have another view about how it is connecting us and a permission slip to release shame about how your creative process works for you. Things are changing quickly – being connected to the Digital Temple allows us gifts, and challenges, but you get to choose how you interface. You have all you need now, to do what you need to do now. As Spirit calls you towards other things – it isn’t perhaps from a place of ‘needing something more’ but a place of staying on the path in community, being held in a container. We don’t just keep signing up for class after class because we lack what we need. Rather, to keep stitching in a creative spiritual practice and community. To see what other guides and healers on the path with us, have for us. And what’s calling from the collective at that time. For me that is what on-going education and gatherings are about. Weaving threads into the day to day. It times past we gathered around the campfire to tell stories, visited our local medicine woman and learned new skills from guilds and mentors. That time is also now. And some of it happens online. More than many of us would like perhaps, but the online part is helping to lessen isolation and create connections in the matrix, that often become real when we get to hug! When our red threads are strong and need to be connected in person, we can make that happen. I can see that sometimes there can be a kind of obsession with taking classes – we all want the next big thing even if we haven’t completed the last thing. I have heard some say our obsession with completion can interrupt our fire of the moment through subtle shame – like – well before you do that you should ‘finish’ x. Artists and creatives sometimes take years to do things – as my teacher Sue would say: “Paint like you have all the time in the world. Paint like this is the only thing you have to do”. This approach, while rather luxurious has an energy to it that changes how we approach things – we approach them with a shifted perspective and the pace of grace. She said my style of teaching was more like drive by painting 🙂 I said, yes, but there is so much more than painting being moved – energy is moved – and sometimes that means my brush is a field of wild flowers instead of a single rose in a crystal vase on a table of lace. Not perfection but chaos in motion. We all have our own timing, and as you continue you will find yours. That said, yes dig in to what you have already signed up for – learn to work on multiple canvases and multiple tracks of study as each are feeding and serving the other. I often work on up to 4 canvases and each one is teaching and opening each other process. Perhaps there was a time and will still be a time when committed creative spiritual communities will be where we spend our time and resources. Perhaps that time is now. Maybe this is that, a global circle. I never imagined how powerful it would be to work online with so many – what it would mean to me, and to them. When I am streaming I feel magically connected in love to the matrix, as if I am with you in the realest sense, hence why I have kept streaming. It is my quantum communion with my Beloveds. I have been a working artist for twenty years – selling paintings retail and wholesale and teaching classes in person. I never set out to make thousands of videos or to spend time in online education. But it called me, or rather my Beloveds called me, and I was resistant, but I answered and I am glad I did. I am working daily on the physical temples too – the places where we can share tea and painting counsel and connect the matter based threads. Our online offerings are anchored in a very physical space. Right now, we are working on our new Sonoma campus while still tending our Healdsburg campus. 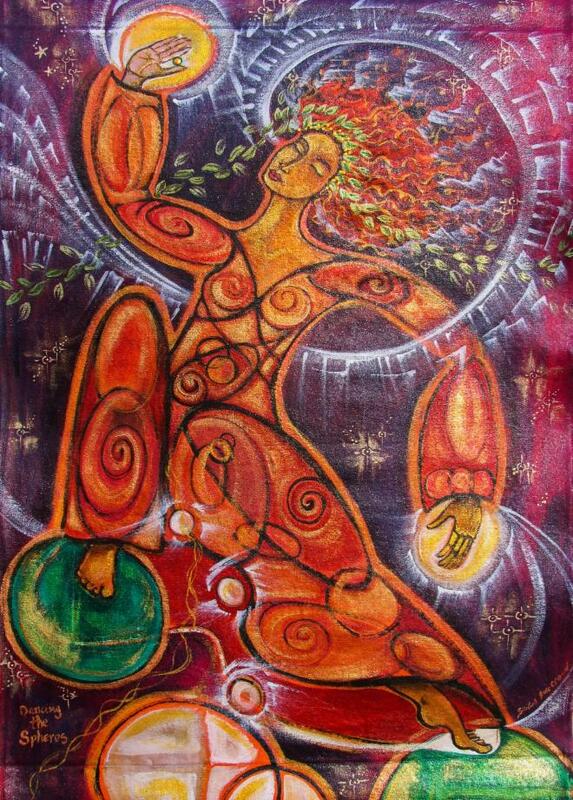 And Terra Sophia – seems like the online community I have is matched in the territory I am given to steward. I have always been a physical space keeper and will continue to hold this ground for us. I want to thank you – each of you – for being a part of revolutionary education – what a journey! And what a hidden blessing to teach in a digital temple of education as well as to invite others to teach with me as in Power Creatives TV. I was just talking with Jonathan this morning about how incredible it is to provide FREE cafe experiences every two weeks, as well as to PAY WOMEN for their gifts when they teach with me. The paid programming of PCTV is providing work for women artists and I love that. AND we are doing so much of it in person, women flying in from around the world to TEACH our communities. It’s rad. As a child one of my earliest memories of service was wanting to end isolation and later, to change the feminine image – that has indeed been being fulfilled. Honing in on what calls you next – isn’t about what you don’t have but about amplifying what you do have. See what calls you – notice what draws your attention. See where your muse wants you to visit next. You have all you need now, to do what you need to do now. Do you judge online marketers? Please. Look again when you look at the free offering from teachers online. It isn’t all about list building and creating money. MUCH OF IT IS PURE SERVICE. Sure they/we get the benefit of people registered – but think of the amount of free education we have had access to since the internet. Power Creatives TV is our offering into that arena. If someone’s stuff doesn’t draw you, just look away and go where you are drawn where you can FEEL and SEE who is sharing something you need/want. It’s ok to say yes, it isn’t all a scam trying to tell you something or sell you something. My VERY best friends all participate in online marketing and classes, I know them, I know their desires and intent. AND yes we make a living and have staff and grow our own projects – but we are here in service to providing powerful models of education. We are working in an alternate energetic temple than many – because LOVE does come first. One of the awesome-sauce things about online education these days is how much FREE and gifted TRUE content there is available from real teachers. I watch and participate in free online stuff weekly – I am curious and encouraged. Our Season One Launch of PCTV has been well received and we are excited to welcome Sarah Drew on Thursday, then in two weeks we have Christine Arylo, following her, Laura Hollick and then Chris Zydel. It’s exciting to be able to offer this. Here’s a little bit of what happened from our first episode of PCTV, Fearless Belonging with Shilo Shiv from India – and there is SO MUCH more friendship and interaction and healing and red threads connected. 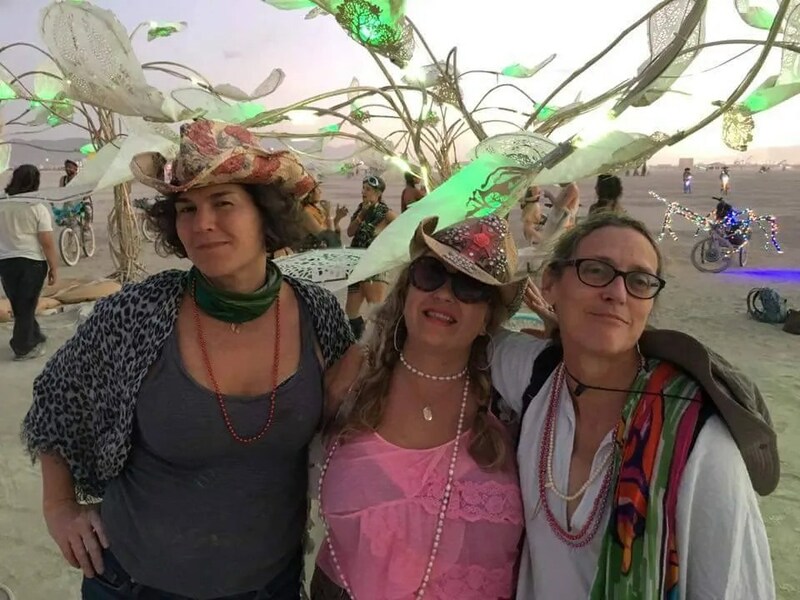 Many layers of connection happen in Intentional Community. Here we are in our physical space, our first workshop with Shilo Shiv Suleman at our new Sonoma Campus. Two days before we reached over 1000 women from different countries for our Free Alchemical Cafe. 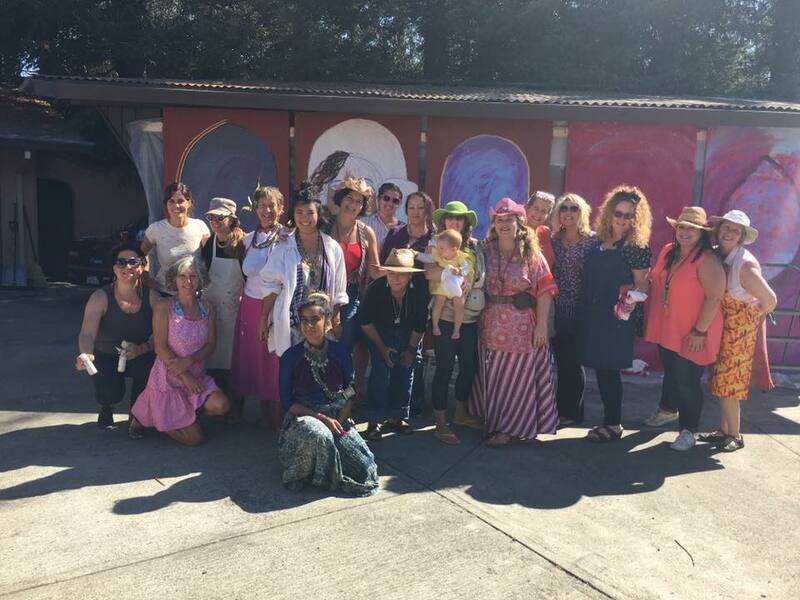 Over 115 women joined us to paint their Fearless Archetype that day. 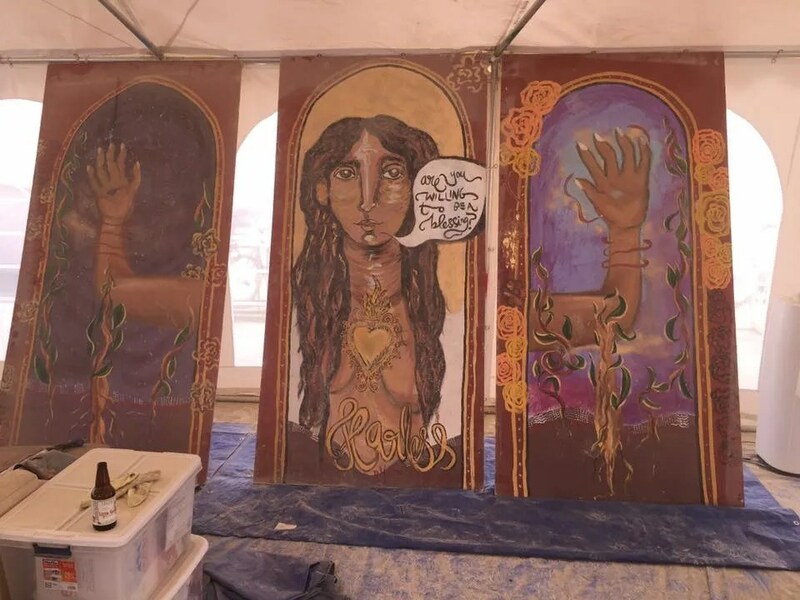 Then we met with 20+ women to paint a mural that made a voyage to Burning Man where people tied prayers onto the painting hosted in a camp with JP Kim of San Francisco, CA and Lorraine Tilbury of France who were bringing Intentional Creativity to the event. They taught Intentional Creativity two times there, and are in the Color of Woman training this year! We also got to hangout with Shilo Shiv at her installation of breathing trees at Burning Man. This is real time. Real love. Real connections. Real resources. We wouldn’t know each other at all if we hadn’t been connecting online. And a big percentage of the income created was shared with Shilo’s Fearless Belonging project. Which she says, often goes right into paint! 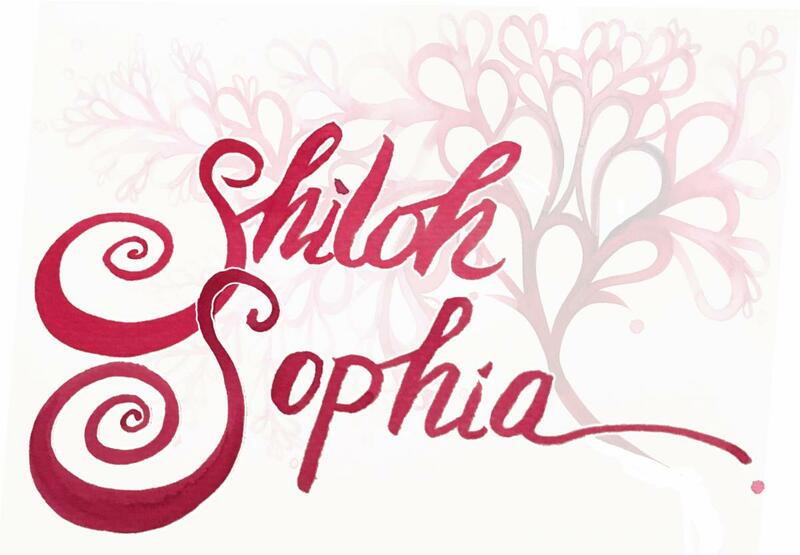 You can see a video of me breathing with the trees at Artist Shiloh Sophia here. Are you willing to be a blessing? Mural started by Red Thread community and Shilo Shiv Suleman – yes in process…. This is your permission slip to study and connect in the way that is most natural for you, to you. Digital temples are real spaces. Release the shame about your creative process, how it works, the time it takes, and your desire to be connected online. It’s ok. We are all seeking connection. We can create it both in the quantum matrix (online) and in physical temples (in matter). What matters is HOW we approach these connections, our intentions. Even the energy we bring to the computer. Computers are electrons and stardust. We already know that everything is responsive, from water, to rocks, to soil, to stars. So the energy we bring, the interface itself changes even the impact it has on us, how we use it, and transforms even the computer into a two way electron exchange of love. This happens in livestreams, and in emails like this one. I am already connected to my love for you for HOURS before an email like this goes out. This is real time. Real love. I am ALL FOR PHYSICAL CONNECTIONS and not spending our lives on phones and computers. AND I am also a voice for the power of connection when we choose for our interactions to be held in the digital temple.